Download "data sheet DONATELLO Rev. 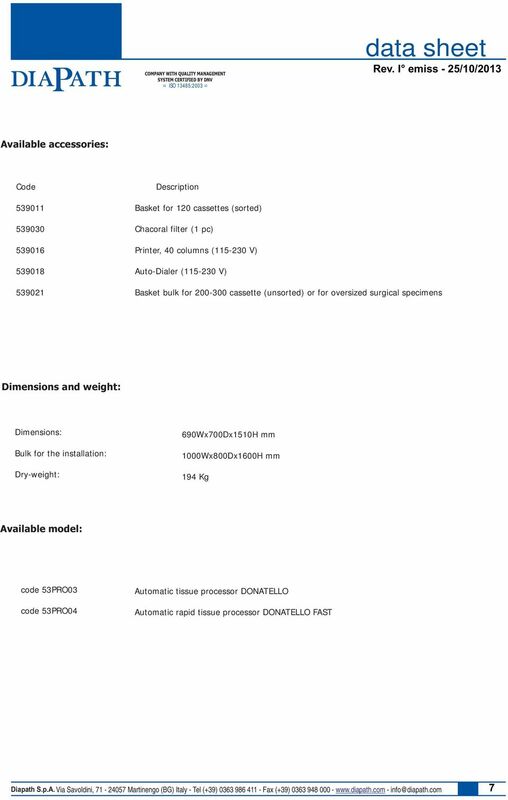 I emiss - 25/10/2013 52PRO03 code Automatic tissue processor DONATELLO"
1 Rev. 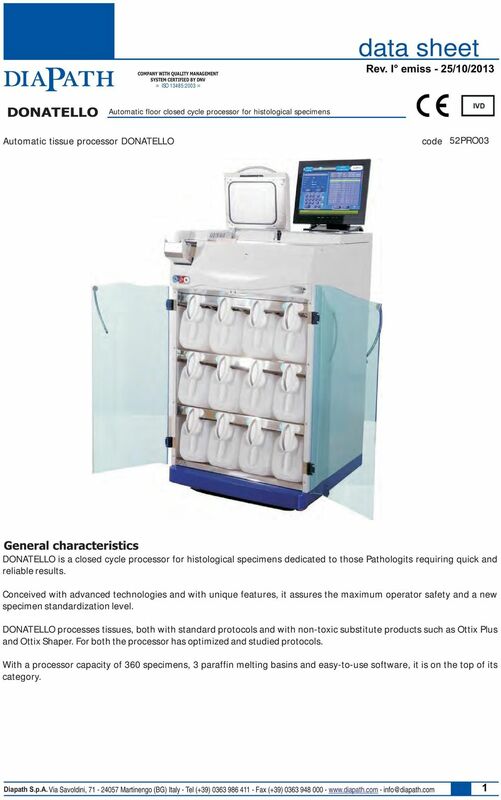 I emiss - /0/0 DONATELLO Automatic floor closed cycle processor for histological specimens Automatic tissue processor DONATELLO code PRO0 General characteristics DONATELLO is a closed cycle processor for histological specimens dedicated to those Pathologits requiring quick and reliable results. 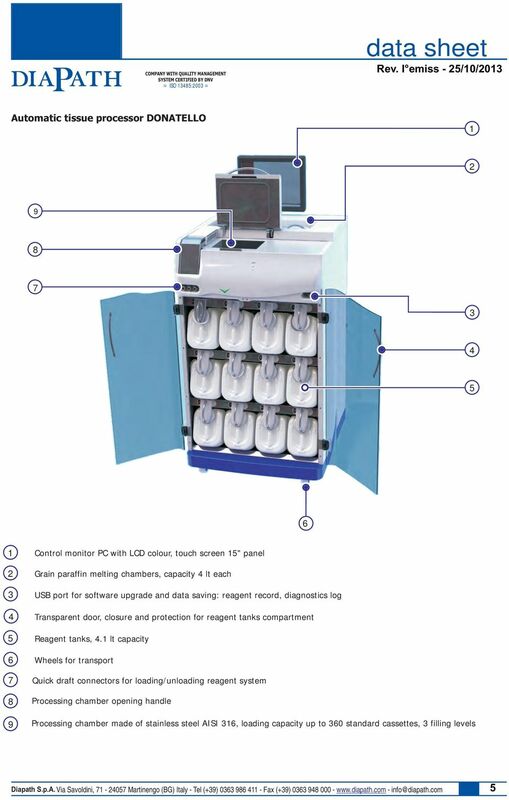 Conceived with advanced technologies and with unique features, it assures the maximum operator safety and a new specimen standardization level. 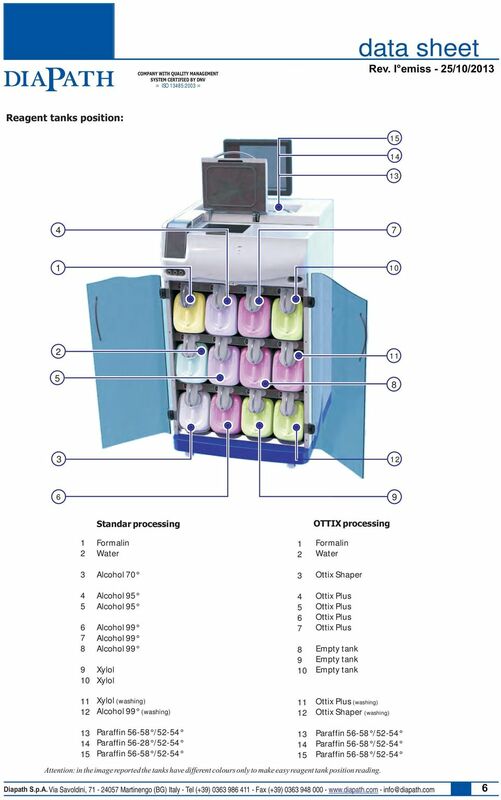 DONATELLO processes tissues, both with standard protocols and with non-toxic substitute products such as Ottix Plus and Ottix Shaper. 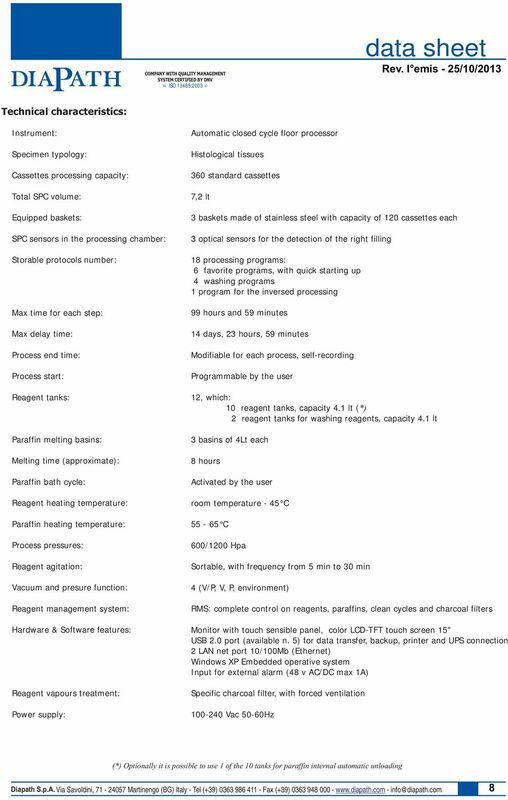 For both the processor has optimized and studied protocols. With a processor capacity of 0 specimens, paraffin melting basins and easy-to-use software, it is on the top of its category. 4 Rev. 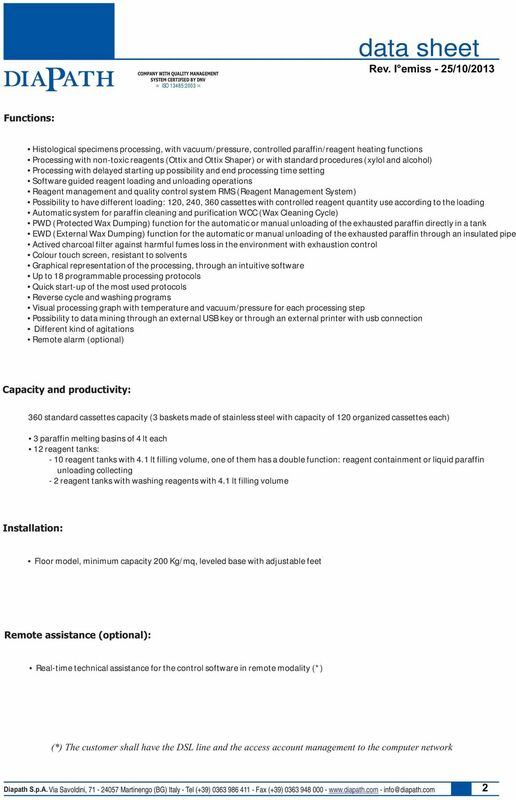 I emiss - /0/0 RMS (Reagent Management System) () Reagent management and quality control system. Advanced software function for reagent exhaustion control. Through a deterministic process, calculation of processing potentiality progressive reduction of each reagent. RMS system controls and signals reagent consumption. Graphical indication of reagent replacement need, when exhausted, avoiding any other processing with non-suitable reagents. () The possible processings number, for each reagent, is defined in accordance to the processed tissue typology and used protocols. For each reagent, a cassettes limit number is set. Tanks with special functions () Some DONATELLO tanks are dedicated to special functions. For a better ease to use, it is possible to unload the paraffin directly into the tank on position (). This option, called PWD (Protected Wax Dumping), avoids the pouring through external pipes and avoids the risk to pour out the liquid paraffin during unloading operations. 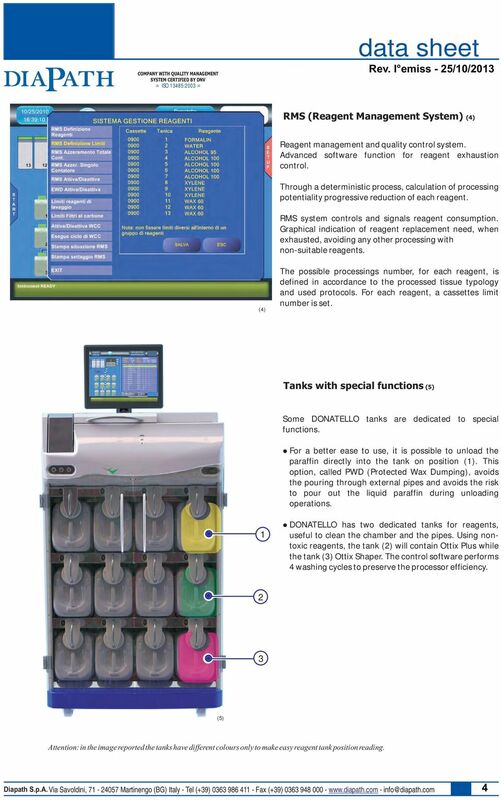 DONATELLO has two dedicated tanks for reagents, useful to clean the chamber and the pipes. Using nontoxic reagents, the tank () will contain Ottix Plus while the tank () Ottix Shaper. 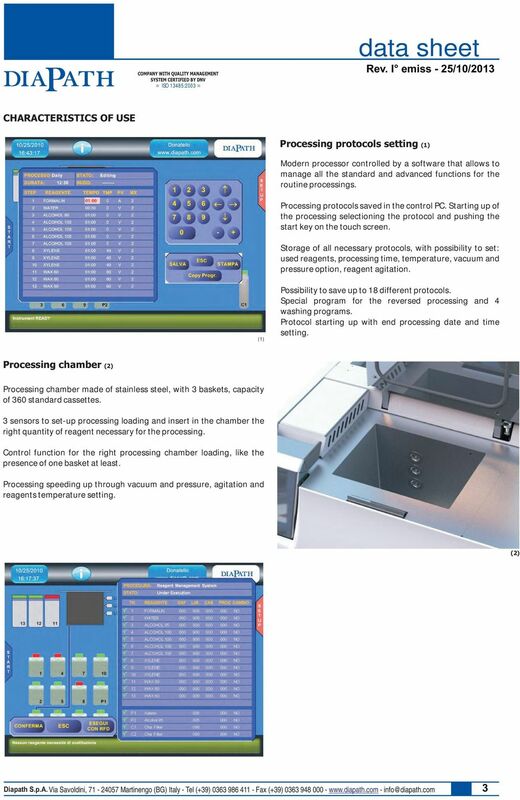 The control software performs washing cycles to preserve the processor efficiency. () Attention: in the image reported the tanks have different colours only to make easy reagent tank position reading. MILESTONE LOGOS J. The right tool for the lean lab. The first personal hybrid tissue processor Quality. Speed. Flexibility. Automation. From simple price computing to multi-store data management solutions, the AC-4000 series will streamline your entire retail operation. Hydro-Jet Eco 0515 SL. Hydro-Jet Eco 0515 SL. Water-Jet Cutting Systems. Robust System with small footprint and maximum operator comfort. Regards from the Team at Rheology Solutions. The PWR-8GHS-RC does not require any reference signal for calibration.